Lenovo ThinkSystem SR570 is a 2-socket 1U rack server for small businesses up to large enterprises that need industry-leading reliability, management, and security, as well as the balance of performance, memory, and flexible storage configurations. The SR570 server is designed to handle a wide range of workloads, such as virtualization and cloud computing, infrastructure security, web serving, and application development. This guide is intended for technical specialists, sales specialists, sales engineers, IT architects, and other IT professionals who want to learn more about the SR570 server and consider its use in IT solutions. Featuring the Intel Xeon Processor Scalable Family, the SR570 server offers balanced performance and storage capacity. The SR570 server supports up to two processors, up to 1 TB of 2666 MHz TruDDR4 memory, up to 10x 2.5-inch or 4x 3.5-inch drive bays with an extensive choice of NVMe PCIe SSDs, SAS/SATA SSDs, and SAS/SATA HDDs, and flexible I/O expansion options with the LOM slot and up to 3x PCIe slots. The SR570 server offers basic software RAID or advanced hardware RAID protection and a wide range of networking options, including selectable LOM, ML2, and PCIe network adapters. The next-generation Lenovo XClarity Controller, which is built into the SR570 server, provides advanced service processor control, monitoring, and alerting functions. 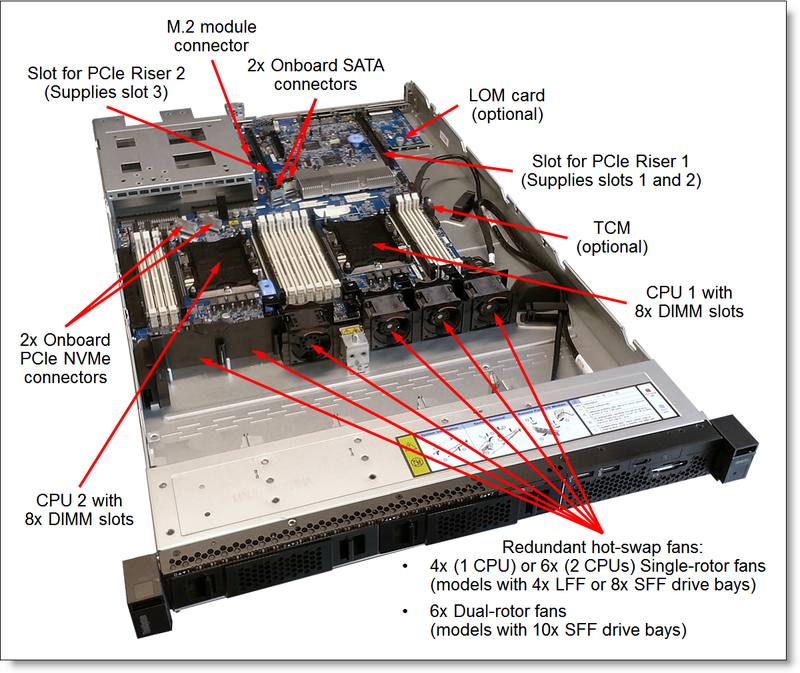 The following figure shows the Lenovo ThinkSystem SR570 models. The SR570 server features a unique AnyBay design that allows a choice of drive interface types in the same drive bay: SAS drives, SATA drives, or U.2 NVMe PCIe drives. The SR570 server offers onboard NVMe PCIe ports that allow direct connections to the U.2 NVMe PCIe SSDs, which frees up I/O slots and helps lower NVMe solution acquisition costs. The SR570 server delivers impressive compute power per watt, featuring 80 PLUS Titanium and Platinum redundant power supplies that can deliver 96% (Titanium) or 94% (Platinum) efficiency at 50% load when connected to a 200 - 240 V AC power source. The SR570 server is designed to meet ASHRAE A4 standards (up to 45 °C [113 °F]) in select configurations, which enable customers to lower energy costs, while still maintaining world-class reliability. The SR570 server offers a balance of processing power, expandability, and cost for small and medium businesses up to the large enterprise. Ease of use and comprehensive systems management tools help make deployment easier. Outstanding reliability, availability, and serviceability (RAS) and high-efficiency design improve your business environment and help save operational costs. Improves productivity by offering superior system performance with the Intel Xeon Processor Scalable Family with up to 26-core processors, up to 35.75 MB of last level cache (LLC), up to 2666 MHz memory speeds, and up to 10.4 GT/s Ultra Path Interconnect (UPI) links. Support for up to two processors, 52 cores, and 104 threads allows to maximize the concurrent execution of multithreaded applications. Intel Hyper-Threading Technology boosts performance for multithreaded applications by enabling up to two simultaneous threads within each processor core. Intel Advanced Vector Extensions 512 (AVX-512) enable acceleration of enterprise-class and high performance computing (HPC) workloads. Helps maximize system performance for data intensive applications with up to 2666 MHz memory speeds and up to 1 TB of memory capacity. Provides flexibility to use SAS, SATA, or NVMe PCIe drives in the same drive bays with a unique AnyBay design. Provides I/O scalability with the LOM slot and up to three PCI Express (PCIe) 3.0 I/O expansion slots in a 1U rack form factor. Reduces I/O latency and increases overall system performance with Intel Integrated I/O Technology that embeds the PCI Express 3.0 controller into the Intel Xeon Processor Scalable Family. Offers protection in the event of a non-correctable memory failure with Single Device Data Correction (SDDC, also known as Chipkill, requires x4-based DIMMs), Adaptive Double Device Data Correction (ADDDC, also known as Redundant Bit Steering [RBS], requires x4-based DIMMs and Intel Xeon Gold or Platinum processors), memory mirroring, and memory rank sparing. Provides easy access to upgrades and serviceable parts (such as processors, memory DIMMs, and adapter cards) with tool-less cover removal. Offers affordable data protection with software RAID and Simple Swap drives and advanced hardware RAID data redundancy with hot-swap drives. Provides availability for business-critical applications with redundant hot-swap power supplies and redundant hot-swap fans. Simplifies servicing and speeds up problem resolution with light path diagnostics. Allows preventive actions in advance of possible failure, thereby increasing server uptime and application availability with Proactive Platform Alerts (including PFA and SMART alerts) for processors, voltage regulators, memory, internal storage (SAS/SATA HDDs and SSDs, NVMe SSDs, M.2 storage), fans, power supplies, RAID controllers, and server ambient and sub-component temperatures. Offers XClarity Essentials software tools that can help you set up, use, and maintain the server. Offers advanced cryptographic functionality (such as digital signatures and remote attestation) with an integrated Trusted Platform Module (TPM) or optional Trusted Cryptographic Module (TCM) or Nationz TPM (available only in China). Keeps user data safe with Lenovo Business Vantage, a security software tool suite designed to work with the Trusted Cryptographic Module (available only in China). Delivers impressive compute power per watt, featuring 80 PLUS Titanium and Platinum redundant power supplies. Enables customers to lower energy costs with design to meet ASHRAE A4 in select configurations. The following figure shows the front of the SR570 server with four 3.5-inch drive bays. The following figure shows the front of the SR570 server with eight 2.5-inch drive bays. The following figure shows the front of the SR570 server with ten 2.5-inch drive bays. 4x 3.5-inch, or 8x 2.5-inch, or 10x 2.5-inch hot-swap drive bays. One USB 2.0 port with XClarity Controller access. The following figure shows the rear of the SR570 server with three PCIe low profile slots. Up to three PCIe expansion slots (depending on the riser cards selected). Two 1 GbE onboard network ports. One 1 GbE port for XClarity Controller. Up to two hot-swap power supplies. The following figure shows the locations of key components inside the SR570 server. 16 DIMM slots (8 DIMM slots per processor). Two onboard NVMe PCIe connectors. Two slots for PCIe riser cards. Four (one processor) or six (two processors or models with 10x SFF drive bays) hot-swap system fans. The following table lists the system specifications for the SR570 server. Memory Up to 16 DIMM sockets (8 DIMMs per processor; 6 memory channels per processor with one DIMM per channel for four channels and two DIMMs per channel for two channels). Support for RDIMMs or LRDIMMs. Memory types cannot be intermixed. Memory speed up to 2666 MHz. With RDIMMs: Up to 512 GB with 16x 32 GB RDIMMs and two processors. With LRDIMMs: Up to 1 TB with 16x 64 GB LRDIMMs and two processors. Memory protection Error correction code (ECC), SDDC (for x4-based memory DIMMs), ADDDC (for x4-based memory DIMMs, requires Intel Xeon Gold or Platinum processors), memory mirroring, memory rank sparing, patrol scrubbing, and demand scrubbing. 6 Gbps NL SATA HDDs up to 10 TB. Internal M.2 SSDs: 6 Gbps SATA up to 480 GB. Intermix of SAS, SATA, and NVMe PCIe drives is supported within a system, but not within a RAID array. NVMe PCIe SSDs do not support hardware RAID controllers. NVMe PCIe SSDs are supported in the AnyBay drive bays. 2.5-inch models: Up to 76.8 TB with 10x 7.68 TB 2.5" SAS/SATA SSDs. 3.5-inch models: Up to 56 TB with 4x 14 TB 3.5" NL SAS/SATA HDDs. Rear: 2x USB 3.0 ports and 1x VGA port. Optional 1x DB-9 serial port. 4x LFF or 8x SFF drive bay models: Four (one processor) or six (two processors) hot-swap single-rotor system fans with N+1 redundancy. 10x SFF drive bay models: Six hot-swap dual-rotor system fans with N+1 redundancy. Power supply Up to two redundant hot-swap 550 W or 750 W (100 - 240 V) High Efficiency Platinum or 750 W (200 - 240 V) High Efficiency Titanium AC power supplies. HVDC support (China only). Hot-swap parts Drives (select models), power supplies, and fans. Systems management XClarity Controller (XCC) Standard, Advanced, or Enterprise (Pilot 4 chip), proactive platform alerts, light path diagnostics, XClarity Provisioning Manager, XClarity Essentials, XClarity Administrator, XClarity Integrators for VMware vCenter and Microsoft System Center, XClarity Energy Manager, Capacity Planner. Security features Power-on password, administrator's password, secure firmware updates, Trusted Platform Module (TPM) 1.2 or 2.0 (configurable UEFI setting). Optional lockable front bezel. Optional Trusted Cryptographic Module (TCM) or Nationz TPM (available only in China). Optional Lenovo Business Vantage security software (available only in China). Operating systems Microsoft Windows Server 2012 R2, 2016, and 2019; Red Hat Enterprise Linux 6 (x64) and 7; SUSE Linux Enterprise Server 11 (x64), 12, and 15; VMware vSphere (ESXi) 6.0, 6.5, and 6.7. Warranty One-year (7Y02) or three-year (7Y03) customer-replaceable unit (CRU) and onsite limited warranty with 9x5 Next Business Day Parts Delivered. Service and support Optional service upgrades are available through Lenovo Services: 2-hour or 4-hour response time, 6-hour or 24-hour committed service repair, warranty extension up to 5 years, 1-year or 2-year post-warranty extensions, YourDrive Your Data, Enterprise Server Software Support, and Basic Hardware Installation Services. Configure-to-order (CTO) models can also be created for factory-integrated server customization. The following table lists the base CTO models of the ThinkSystem SR570 server. The following table lists the base chassis for CTO models of the SR570 server. If the number is shown as "x+y", it represents the quantity of the SAS/SATA + AnyBay drive bays. Cable Management Arm (CMA): "Y" = Included; "N" = Not included, optional. "C2" = 2.8 m country-specific line cord. ^ The server supports up to three I/O slots on the riser cards. An internal storage controller occupies the PCIe slot 1. The onboard SATA RAID controller does not consume a PCIe slot. ^ The server supports one onboard PCIe slot 4 and up to five I/O slots on the riser cards. An internal storage controller occupies the PCIe slot 4. The onboard SATA RAID controller does not consume a PCIe slot. † Tool-less Friction Rail; no support for optional CMA. The SR570 server supports one or two Intel Xeon Bronze, Silver, Gold, or Platinum processors of up to 150 W TDP. The following table lists the specifications of the processors for the SR570 server. For the SR570 server models that come standard with one processor, the second processor can be ordered, if required (see the following table for ordering information). The second processor must be of the same model as the first processor. The second processor option includes a processor, a heatsink, and two additional single-rotor system fans. * For CTO configurations, the feature code represents a processor, and fans and heatsinks are derived by the configuration tool. The SR570 server supports up to 8 TruDDR4 memory DIMMs with one processor and up to 16 DIMMs when two processors are installed. Each processor has six memory channels, and there is a one DIMM per channel for four channels and two DIMMs per channel for two channels for a total of 8 DIMMs per processor. Mixing x4 and x8 RDIMMs and RDIMMs of different capacity is supported. All DIMMs in the server operate at the same speed up to 2666 MHz, which is determined by the maximum memory speed supported by the specific processor. RDIMMs: 512 GB (256 GB per processor). LRDIMMs: 1024 GB (512 GB per processor). If memory mirroring is used, then DIMMs must be installed in quantities of 2 or 4 per processor for mirroring across two memory channels, or 3 or 6 per processor for mirroring across three memory channels. All DIMMs must be identical in type and size. If memory rank sparing is used, then a dual-rank or quad-rank DIMM must be installed per populated channel (the DIMMs do not need to be identical; single-rank DIMMs are not supported). In rank sparing mode, one rank of a DIMM in each populated channel is reserved as spare memory. The size of a rank varies depending on the DIMMs installed. SDDC, memory mirroring, and memory rank sparing modes are mutually exclusive. Only one operational memory mode can be enabled on the server, and it is a system-wide setting. The following table lists memory options available for the SR570 server. * The maximum quantity shown is with one processor / two processors. In addition, the SR570 server models can be configured with one or two internal M.2 SATA SSDs. The server also supports configurations without drive bays. The following table lists the internal storage options for the SR570 server. * These backplane kits can be factory-installed in standard or custom (CTO or Special Bid) models, and they might not have an option part number assigned. ** Field upgrade only; used for upgrading models without any drive bays to 8x 2.5" SAS/SATA hot-swap drive bays. Models without any drive bays that are based on the 8x 2.5" chassis (feature code AXEY) support adding drive bays by using the 2.5" SATA/SAS 8-bay backplane kit (4XH7A08762). Models without any drive bays that are based on the 10x 2.5" chassis (feature code AXEX) support adding drive bays by using the 2.5" 10-bay AnyBay backplane kit (4XH7A08768). Lenovo AnyBay allows a choice of drive interface types in the same drive bay: SAS drives, SATA drives, or U.2 NVMe PCIe drives. U.2 NVMe PCIe SSDs in the AnyBay drive bays require either the second processor (enables the onboard NVMe controller) or the 1610-4P NVMe Switch Adapter to be installed. Note: The 1610-4P NVMe Switch Adapter is supported only in the configurations with one processor. Models with 10x 2.5-inch drive bays and an 8-port SAS RAID controller or HBA support only NVMe drives in the AnyBay drive bays. The backplane upgrade kits include drive backplanes and required SAS cables, power cables, and drive bay fillers; storage controllers are not included. The M.2 Enablement Kit (7Y37A01092) supports up to one M.2 SATA SSD which is connected to the SATA port on the Intel Platform Controller Hub (PCH). The M.2 with Mirroring Enablement Kit (7Y37A01093) is connected to the Intel PCH via the PCIe link, and the kit supports up to two M.2 SATA SSDs that can be configured in a RAID-1 or RAID-0 drive group, or they can operate as separate drives. The following tables list supported internal storage configurations with the SAS/SATA and AnyBay backplanes. ** The 1610-4P NVMe Switch Adapter in the configurations with one processor, or the onboard NVMe controller in the configurations with two processors. The following table lists the storage controllers and options for internal storage of the SR570 server. * The onboard SATA controller integrated into the Intel C622 Platform Controller Hub (PCH) supports non-RAID (JBOD) AHCI mode or a hardware-assist, software RAID feature (Intel Rapid Storage Technology Enterprise [RSTe]). Low profile SAS RAID controllers and HBAs for internal storage are supported in the PCIe x8 slot 1 supplied by the riser card 1. The onboard NVMe interface provides 4x PCIe 3.0 x4 ports for JBOD (non-RAID) connectivity to U.2 NVMe PCIe SSDs in the AnyBay drive bays, and it requires the second processor to be installed. The 1610-4P NVMe Switch Adapter provides 4x PCIe 3.0 x4 ports for JBOD (non-RAID) connectivity to U.2 NVMe PCIe SSDs in the AnyBay drive bays, and it is supported in the PCIe x16 slot 2 supplied by the x8/x16 riser card 1 in the configurations with one processor only. Important: The onboard Intel RSTe is not supported by virtualization hypervisors, including VMware vSphere (ESXi), Linux KVM, Xen, and Microsoft Hyper-V. The following tables list drive options for the SR570 server. The SR570 server supports the external USB optical drive option listed in the following table. The SR570 server supports one LOM card slot and up to three PCIe slots with different riser cards installed into two riser sockets on the system planar (one riser socket supports installation of one riser card). Slot 3 is not present if the COM Port Upgrade Kit is installed. Riser 1 supplies slots 1 and 2, and Riser 2 supplies slot 3. The slots that are available for use depend on the number of riser cards that are installed and whether the second processor is installed, as shown in the following table. * The LP+FH Riser 1 can be factory-installed by selecting the feature codes AUWC (LP+LP Riser 1) and AUWS (LP+FH Bracket). The COM Port Upgrade Kit, part number 7Z17A02577, is used for mounting the external serial port on the rear of the SR570. This option includes the bracket and the cable. The COM Port option is mounted in place of the PCIe slot 3, and the PCIe slot 3 cannot be used. The SR570 server has two onboard 1 GbE ports (no 10/100 Mb support) and up to two additional onboard 1/10 GbE network ports (no 10/100 Mb support) with optional LOM cards. Onboard ports and LOM cards use the Intel Ethernet Connection X722 1/10 GbE technology integrated into the Intel C622 Platform Controller Hub (PCH). The server also supports ML2 adapters that are installed in the custom ML2 slot provided by an ML2 riser card. The LOM cards support direct connectivity to the XClarity Controller via the Network Controller Sideband Interface (NSCI) for out-of-band systems management. Note: ML2 network adapters do not support NSCI when used in the SR570 server. The following table lists the network adapters that are supported with the SR570 server. * The adapter comes without transceivers or cables; for ordering transceivers or cables, see the configuration notes below the table. ML2 network adapters are supported in the ML2 x8 slot 2 supplied by the x8/x8ML2 Riser Card 1 (7XH7A05892). PCIe full-height network adapters are supported in the full-height PCIe x16 slot 2 supplied by the PCIe x8/x16 LP+FH Riser Card 1 (7XH7A05893). PCIe Low Profile network adapters are supported in the low profile and full-height PCIe x8 and x16 slots supplied by the riser cards 1 and 2. The PCIe x16 slot 3 requires the second processor to be installed. Supported transceivers or DAC cables should be purchased for the 10 GbE SFP+ adapters, and UTP Category 6 or Category 5e cables should be purchased for the 10 GbE (Cat6) or 1 GbE (Cat5e or Cat6) RJ-45 adapters. The maximum number of transceivers or cables that are supported per adapter equals the quantity of the adapter ports, and all adapter ports must have the same type of the transceiver or cable selected. * The Emulex VFA5.2 ML2 (00AG560 and 01CV770) and PCIe (00AG570 and 00AG580) network adapters do not support active SFP+ DAC cables. 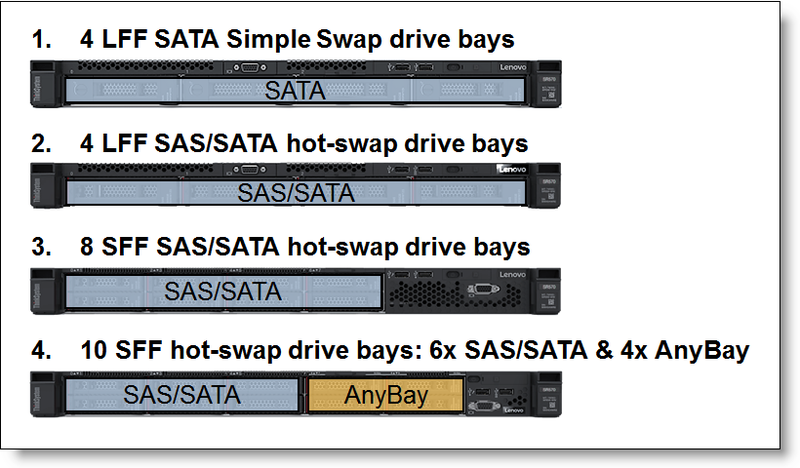 The following table lists SAS RAID controllers and HBAs for external storage attachments that are supported by the SR570 server. Low profile SAS RAID controllers and HBAs for external storage are supported in the low profile and full-high PCIe x8 and x16 slots supplied by the riser cards 1 and 2. The PCIe x16 slot 3 requires the second processor to be installed. The total quantity of the RAID 730-8i 2GB, RAID 930-8i, and RAID 930-8e controllers in a supported combination in the server must not exceed 2 (up to 2 supercapacitors can be mounted in the server). The following table lists Fibre Channel HBAs supported by the SR570 server. Configuration note: FC HBAs are supported in the low profile and full-high PCIe x8 and x16 slots supplied by the riser cards 1 and 2. The PCIe x16 slot 3 requires the second processor to be installed. The SR570 server supports the flash storage adapters listed in the following table. Flash storage adapters are supported in the low profile and full-height PCIe x8 and x16 slots supplied by the riser cards 1 and 2. The PCIe x16 slot 3 requires the second processor to be installed. The Flash storage adapters are supported only in the environments with the air temperature of up to 35 °C (95 °F). The SR570 server supports up to six hot-swap system fans that provide N+1 cooling redundancy. SR570 server models with 4x 3.5-inch or 8x 2.5-inch drive bays use single-rotor fans: Models with one processor include four system fans, and models with two processors include six system fans. SR570 server models with 10x 2.5-inch drive bays include six dual-rotor fans for models with one or two processors. Configuration note: If Intel Xeon 8164 processors are installed in the server models with 4x 3.5-inch or 8x 2.5-inch drive bays, the server performance might be impacted in case of a system fan failure. The SR570 server supports up to two redundant power supplies, and is capable of N+N redundancy depending on the configuration. A second power supply can be added to the models that come with one power supply. Minimum of 1 and maximum of 2 power supplies per system. If 2 are installed, power supplies must be identical. Power supplies support AC (Worldwide) and HVDC (China only) power sources. The SR570 server ship standard with or without a power cord (model dependent). A hot-swap power supply option ships without a power cord. The following table lists the country-specific line cords and rack power cables that can be ordered for the SR570 server. The SR570 server contains Lenovo XClarity Controller (XCC), which provides advanced service-processor control, monitoring, and alerting functions. XClarity Controller offers three functional levels: Standard, Advanced, and Enterprise. By default, the SR570 server includes XClarity Controller Standard features, and it can be upgraded to Advanced or Enterprise functionality by using the Features on Demand (FoD) upgrades. All SR570 server models include basic light path diagnostics, which provides the system error LED on the Operator information panel on the front of the server and the LEDs near the monitored components (for example, the DIMM error LEDs on the system board). Lenovo XClarity is a centralized systems management solution that helps administrators deliver infrastructure faster. This solution integrates easily with Lenovo x86 servers, RackSwitch switches, and DS Series storage, providing automated agent-less discovery, monitoring, firmware updates, configuration management, and bare metal deployment of operating systems and hypervisors across multiple servers. Lenovo XClarity Administrator is an optional software component for the SR570 server which can be downloaded and used at no charge to discover and monitor the SR570 and manage firmware upgrades for them. Lenovo XClarity Energy Manager is an optional software component for the SR570 server that is licensed on a per managed node basis, that is, each managed server requires a license. The 1-node Energy Manager license is included in the XClarity Controller Enterprise upgrade. The following table lists the security options that are available for the SR570 server. Lenovo Business Vantage is a security software tool suite (available only in China) designed to work with the Trusted Cryptographic Module (TCM) adapter for enhanced security, to keep user data safe, and to erase confidential data completely from a hard disk drive. Encrypts files to ensure data safety by using the TCM. The following table lists the rack installation options that are available for the SR570 server. * The CMA Upgrade Kit for Tool-less Slide Rail is supported with the Tool-less Slide Rail (7M27A05702) only. ** The CMA Upgrade Kit for Screw-in Slide Rail is supported with the Screw-in Slide Rail (4M17A07274) only. *** Factory-installed only; no field upgrade. * If a 0U PDU is used, the rack cabinet must be at least 1100 mm (43.31 in.) deep if no CMA is used, or at least 1200 mm (47.24 in.) deep if a CMA is used. ** If a 0U PDU used, the rack must be at least 1000 mm (39.37 in.) deep. For the latest information about the specific versions and service levels that are supported and any other prerequisites, see the Operating System Interoperability Guide: http://lenovopress.com/osig. The SR570 server has a one-year (7Y02) or three-year (Machine Type 7Y03) customer-replaceable unit (CRU) and onsite limited (for field-replaceable units [FRUs] only) warranty with standard call center support during normal business hours and 9x5 Next Business Day Parts Delivered. The following table lists the 12 Gbps SAS external drive enclosures that are offered by Lenovo that can be used with the SR570 for storage expansion. The following table lists the external storage systems that are currently offered by Lenovo that can be used with the SR570 in IT solutions. The following table lists the external backup options that are offered by Lenovo that can be used with the ThinkSystem SR570 for backup solutions. The following table lists the Ethernet LAN switches that are offered by Lenovo that can be used with the ThinkSystem SR570 for network connectivity. The following table lists currently available Fibre Channel SAN switches that are offered by Lenovo that can be used with the ThinkSystem SR570 for external FC SAN storage connectivity. The following table lists the rack cabinets that are currently offered by Lenovo that can be used for mounting the ThinkSystem SR570 and other IT infrastructure building blocks. The following table lists the KVM switches and consoles that are offered by Lenovo that can be used for providing console access to the ThinkSystem SR570. The following table lists the power distribution units (PDUs) that are currently offered by Lenovo that can be used for distributing electrical power to the ThinkSystem SR570 and other IT infrastructure building blocks mounted in a rack cabinet. The following table lists the uninterruptible power supply (UPS) units that are currently offered by Lenovo that can be used for providing electrical power protection to the ThinkSystem SR570 and other IT infrastructure building blocks.